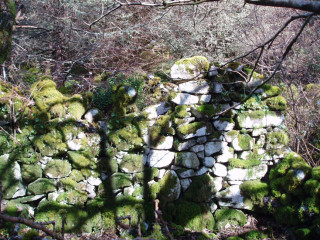 In Glengowla West, Oughterard, there is a rock known locally as “Carraig an Chailín”. 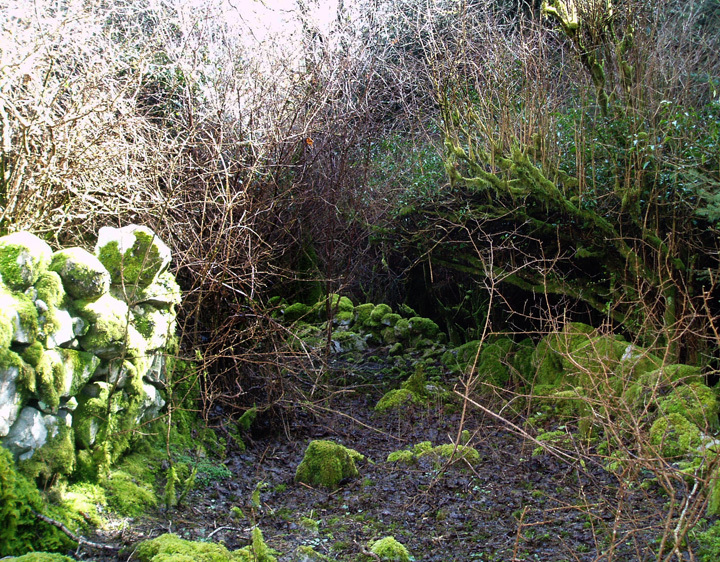 The people of the area would pass this rock daily on their way to Deradda, Glengowla, Oughterard to check on their stock. 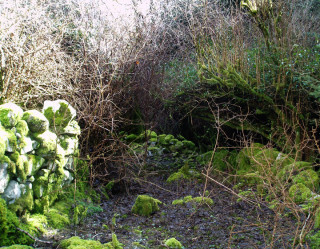 The dipping tank was built in an old wall by the late Josie Geoghegan and a second old wall where the remains of an old house can be seen held the sheep awaiting dipping, with a large yard to let them dry out in before letting them out into the hills. Connemara ponies and cattle were also kept there. Several ruins of a village were found in Deradda. The village was built under a small sheltering bluff on the hillside and lay amongst a nice grassy area, some of which had been cultivated for potato crops. Twenty years ago these ruins were still free from the smothering mass of trees, and one could visualise what living conditions were like on this mountainside 200-300 years ago. The sturdy lichen covered natural stone gables of the roofless houses were in themselves beautiful to behold, but the layout of the village was fascinating. From the remaining ruins, comprising of some 4-5 buildings only, it appeared that the houses were clustered close together rather in the style of the close knit community of the ancient Claddagh Village of Galway city. 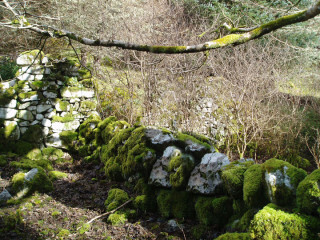 The single stone-walls of a connecting pathway between two of the houses still stood intact, covered with grayish white lichen. The largest building, and the only one with a proper chimneystack, was easily identified as the Shebeen. This house was built by the late John Geoghegan with the help of Henry O Toole (Tom Hannraoi), Leam and the chimney was built by the late Colman Walsh Leam who was considered a master of the trade. According to Hannah Geoghegan, daughter of John Geoghegan this was not a Shebeen and “ There was no trafficking of Poteen in the house or anywhere near it. The only Shebeen was in Glengowla West and was known far and wide as “ Tarrabildy’s. According to Hannah there was a pathway from Deradda gardens north through lands of Glengowla West on to the Railway bridge known locally as the “ Lander’s” bridge across the river from there to the main Galway – to Clifden road opposite the late Paddy and Mary Conneely’s house. The moats erected on either side of that right-a-way are still to be seen. 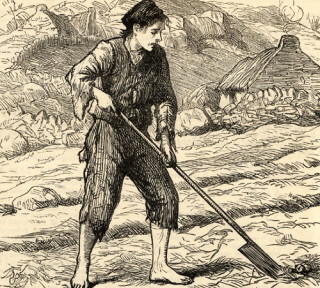 The area on which the village was built was not large and was surrounded by bog. Some stunted mountain ash their branches blown into contorted shapes by the prevailing winds lent an eerie air to the area. The story of this particular village is the familiar one of the potato crop failure forcing the entire community to emigrate and this they did en-masse on a September day 1847. Whether this story of that sad day stands up to scrutiny is of no great importance – what is important is the village they left behind, an actual visible example of how small communities built their homes and which endured the ferocity of the elements through the years until it was planted by the Forestry Department in the early 70’s. The plantation in itself was not offensive, in fact it lends a variety to what was rather a bleak mountainside, but unfortunately in the planting the possible aesthetic value of the ruins appear to have been over looked and the saplings were planted in and out amongst the ruins. These are now grown into mature trees and have effectively obliterated the little village. The total area of Deradda arable and mountain grazing is 1486 acres 2 roods 30 perches – Statue measure. Local folklore maintains that the waters of the local village well had a cure for warts. You were expected to throw money into the well ( that is if you had money) and visit it three times before you were guaranteed a cure! To retain the village intact would have been an expensive – the cost of a few dozen or so trees, but it would have been of inestimable value to have that little gem of our past still visible. Compiled by Mary Kyne from articles written by the late Olive Walsh and Hannah Geoghegan, Glengowla in 1993 in the “Oughterard Newsletter.” Photos by kind permission from Maggie Land Blank collection.